In 1648, Lieutenant General Oliver Cromwell (1599 – 1658) led the Parliamentarian forces who took Pembroke Castle back from ex-Parliamentarian mutineers. At the time the Civil War (1642 – 1651), during which the Parliamentarians (Roundheads) fought the Royalists (Cavaliers) over their disagreement about how the Kingdom of England should be governed, was in its second phase. Colonel Poyer, Governor of Pembroke Castle, held the Castle for the Parliamentarians throughout most of the War until, in early 1648, at the end of their tether in their efforts to get the back pay they were owed, his troops – in common with many others across South Wales – mutinied. In March 1648 Poyer declared for the King (Charles I), thus changing sides and supporting the Royalists. Lieutenant General Oliver Cromwell, who would later become the first Lord Protector of the Commonwealth of England, Scotland and Ireland, brought an army to quell the various groups of mutineers and reclaim the properties they occupied for the Parliamentarians. 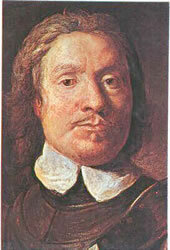 Leaving subordinate officers with troops to handle the occupations at Chepstow and Tenby Castles, Cromwell and his main force marched on Pembroke, arriving on 24 May. Cromwell found that Pembroke Castle was much more difficult to lay siege to than he had expected. It was protected on three sides by water and on the fourth by high, thick walls and a deep ditch. The siege lasted eight weeks until, according to some reports, Cromwell’s men discovered and blocked the conduit through which fresh water was delivered to the Castle, thus depriving the mutineers of this vital commodity. General Poyer gave up the struggle and surrendered the Castle on 11 July 1648. Cromwell went on to achieve further successes and high office. Poyer was court-martialled and executed in April 1649.